There are multiple ways to receive free spins and respins galore in the Neon Reels slot by iSoftBet. This high powered electric neon game also features Diamond Respins during free spins, and when you play for real money you can hit the progressive Neon Jackpot. The Neon Reels slot developed by iSoftbet, features 10 free spins that are launched when 3 or more scatter symbols land on the reels. During the bonus game, Wild symbols provide you with a further opportunity to obtain additional free games and the appearance of three or more scatter symbols during the round, will increase the duration of the round by a further ten free spins. 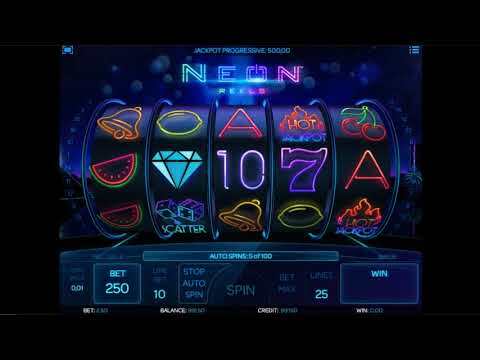 In the full version of Neon Reels available in legal online casinos, you get the chance to win the Neon Jackpot. To "hit" the jackpot, you need a combination of five Hot Jackpot symbols and you must be playing with the maximum bet, as big stakes win big prizes. The appearance of two diamond symbols on the first reel activates the much coveted respin feature. The images and wild symbols will be 'held', and the slot will trigger 2 diamonds respins. Each turn allows for the chance to complete the 'diamond' combination and new symbols with diamonds and wild symbols that appear during the round of respins are also held in place. Play more online slot games for free with respins and other bonus features at neonslots.com. Diamond - is capable of creating separate sequences and launching a prize option. The combination of 2, 3, 4 and 5 characters will produce 2, 20, 50, 150 multipliers and the appearance of two symbols on the first reel activates 'Diamond' respins. However, if a wild is used in a combo of diamond symbols, the re-spins will not be triggered. Wild - replaces the usual symbols, except the Scatter and the Hot Jackpot, to create or extend winning combinations. In the free spins round, 'Wild' symbols increase winnings. Scatter - is the image of 2 dice with the corresponding inscription 'Scatter'. When 3-5 pictures land anywhere on the reels they start a round of free spins. Hot Jackpot - when playing for Real Money, a sequence of five of these symbols will allow you to "hit" the progressive jackpot. A number of winning combinations can be formed at once. 'Configuration' opens a menu with three horizontal lines and is located in the upper right corner. To display the paytable click on the Paytable button. Play more Neon themed slots at NeonSlots.com.